Recent studies show that 86% of consumers' mobile time is spent on mobile apps. 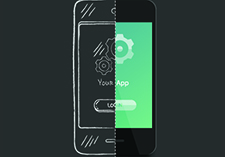 To keep up with this growing trend, 90% of U.S. enterprises are increasing their investments in mobile app development. But what slows people down from actually executing an efficient mobile app development process, is not knowing how to plan and budget for them. Because mobile apps can be extremely broad, the main purpose of the app often drives the development budget, determining mobile app development cost. For example, a small calculator application used for a niche business function will require a much smaller investment than an enterprise-wide support application for a global sales force. Is the app intended for public use? If not, what subset of the population will use the app? Is the app slated for internal use only? If so, what are the internal users that will use the app? What are users trying to achieve by interacting with the app? Examples: speed up ordering time, find close-by distribution centers, pull current documents, etc. Determining whether to support iOS, Android, Windows Mobile, or all of the above in your enterprise mobile applications will help predict development time, and therefore cost. Each platform is different—for example, Android fragmentation (caused by the fact that there are over 18,000 different devices/screen sizes running on Android) can make it difficult to ensure your app works well for each unique piece of hardware, whereas the iOS platform only needs to support a few different Apple devices. The device type is also a factor that needs to be considered. Do you only want to support phones? What about tablets? Or should the app be universal? And lastly, you need to decide if you want to invest in a native app (fully responsive apps that are installed on devices) or a hybrid app (part native and part web app, with one code base, deployed to different platforms). Native apps are typically more expensive to develop but are a more premium product that will give you better performance and more custom-designed features. Integration points will undoubtedly cost you more money during the build but will save you time and money in the long run. What 3rd party systems does the app need to integrate with? Many of our apps, such as the one we built for BASF, integrate with complex backend systems (Salesforce, SAP, Sharepoint, social media, etc), automating previously manual processes. Where will content for the app come from? Does the content already exist in other data structures (DB’s, API’s) or is there new content being developed for the app specifically? Who will control the content? Are there multiple stakeholders involved? Is there an established editorial workflow for review/approval of content? Often our clients’ desire to include complex UI elements results in a much nicer User Experience. Will your app make use of real-time 3D graphics, complex visual transitions, animations, and multiple objects animating at the same time? Then it’s probably going to cost more. This will also affect the native vs. hybrid development decision mentioned above since many hybrid app frameworks can't take advantage of hardware-accelerated User Interfaces. Part of what makes mobile applications unique is their ability to take advantage of the "smart" parts of your smartphone. If you want to be able to pull in features like the phone's GPS, location-based functionalities (such as iBeacon), accelerometer, gyroscope (which detects motion), and the camera (although this is typically pretty easy), there may be cost implications. Once your enterprise mobile applications are deployed, you can't just pat yourself on the back. You need to think about a maintenance plan from the very beginning and factor it into costs as a certain percentage. This plan should include what new features and functionalities will be introduced, and when. There's an arms race going on between operating systems, and it's important to keep apps up to date with every new release (at least once a year). Plan to proactively update the app or face the fact that it's going to become irrelevant and deleted by users. This plan should go hand in hand with your overall digital strategy, helping you stay ahead of the digital curve. We hope this list helps you get a better idea of how much your mobile app will cost to develop.